Because I fell in love with you the night you took my soul. I heard a lot about Molly McAdams, but never had the chance to read her work before now. Therefore, when I received a request from the publisher asking me to review I See You, I did not hesitate. The book was advertised as having a love triangle theme, which further peaked my interest. I love the drama and the emotions that are usually found in these types of stories. 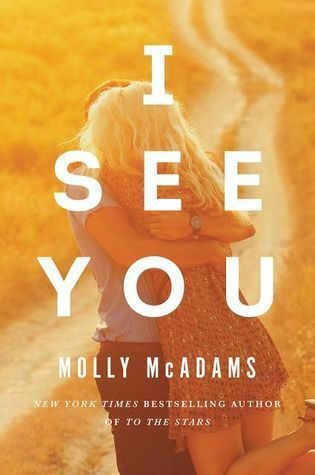 I See You is a story about a college student who had a chance encounter with a handsome stranger, one that touched her to the depths of her soul. Three weeks after this unforgettable experience Rorie returned to the location where she had met the stranger, hoping to rekindle that magical moment. Unfortunately, she did not find him. However, in the process of searching, she met Declan. Life has a funny way of throwing us curveballs, especially at times when all is going well. Rorie's curveball was her past colliding with her present. Just when she thought she would never see the handsome stranger again, he came waltzing back into her life. Things were made more complicated by the fact that he was Declan's adopted brother. An important thing for in a story is being able to establish a connection with the characters. Of all the characters, Declan was the only one I did not establish a connection with. I think this was due to him not having been present for most of the story. I was expecting more interaction from him, seeing that this was supposed to be a love triangle. I didn’t get the feeling that he truly loved Rorie until near the end of the book. From the little that I saw of him, he struck me as being weak. He allowed his mother to railroad Rorie and never once did he stand up for her. Jentry was the highlight of the story. I was secretly hoping that he would be Rorie’s choice. Did I get my wish? You would have to read the book to find out. Jentry had not forgotten Rorie and when he discovered that she was his brother’s girl he was devastated. He was willing to fight for her, but at the same time, he was not above stepping aside if he was not her choice. He was protective of her. When he discovered how callous his mom was towards her, he was not afraid to confront her. I was sympathetic towards Aurora. I would not want to be in her position, having to make choices that would lead to someone getting hurt. Some may consider her weak for allowing Declan’s mom to treat her like trash. I understood where she was coming from. I am glad that she did not allow the negativity to destroy her and that she did respond in a way that would be considered disrespectful. Declan’s mom was a nightmare. However, she managed to redeem herself. I appreciated the fact that she recognized that she was wrong and sought to make amends. The problem I had with this story was the jumps in time. Usually, I don’t have a problem with stories told in this fashion, but in this instance, it was confusing. Fortunately, as the story progressed events became much clearer. This was due in part to the second half of the story being told in the present. This story evoked a wide range of emotions. It left me feeling frustrated, angry, sympathetic and tense as I watched the events played out. I enjoyed this story and I am looking forward to reading more from this author. I received a copy from the publisher. The opinions expressed above are based on my honest view and is in no way influenced by any form of compensation.